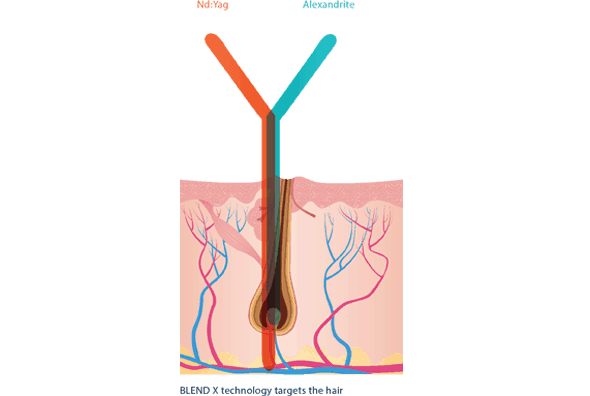 What is BLEND X™ Technology? The Alexandrite wavelength at 755 nm, which is ideal for treating skin tones 1, 2 and 3 (fair and light skin tones). It is highly absorbed in melanin and is therefore not safe for use on darker skin tones. The Nd:YAG wavelength at 1064 nm, which is ideal for treating skin tones 4, 5 and 6 (4 being tanned skin and 5 and 6 darker skin tones) as the absorption by melanin is much lower than with the Alexandrite wavelength. This wavelength is highly absorbed in oxyhemoglobin, which affects the blood supply to the hair follicle. When using these technologies, treatment providers often need to use high settings of each wavelength to effectively remove hair. This can result in more painful treatments and temporary complications. In order to solve these challenges, Lumenis introduced BLEND X technology. This unique technology is the first of its kind to synchronize Alexandrite(755nm) and Nd:YAG(1064nm) wavelengths to fire with adjustable proportions. With this technology, each pulse can be BLEND Xed when fired with varying proportions to tailor treatment, and customized to fit the patient’s specific skin type, hair color and thickness for the most effective treatment. 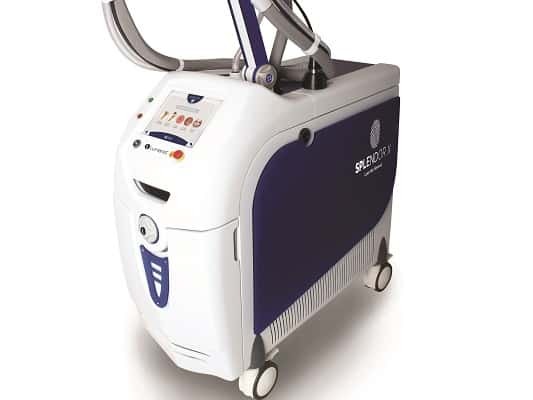 BLEND X technology is used to power the SPLENDOR X solid-state laser device. With this powerful, fast and versatile device, treatment providers can synchronize Alexandrite and Nd:YAG wavelengths to customize treatment options for patients with different skin and hair type combinations.